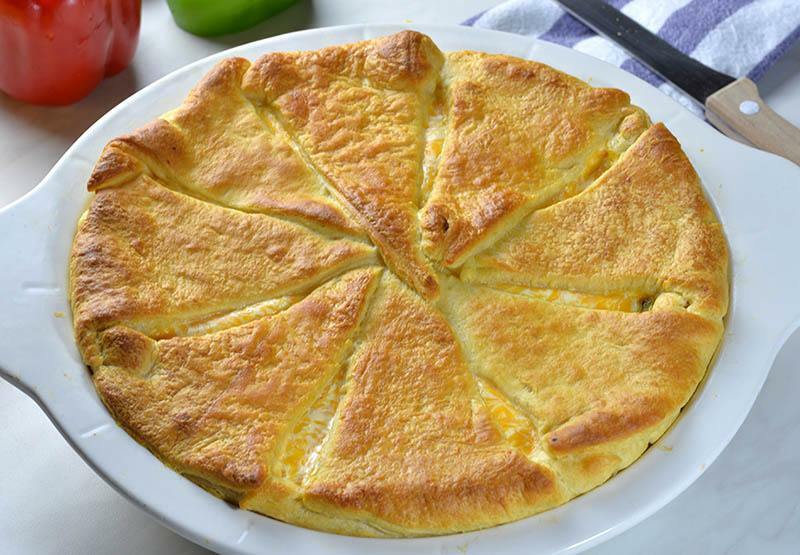 Southwest Crescent Casserole is simple and easy meal for whole family. 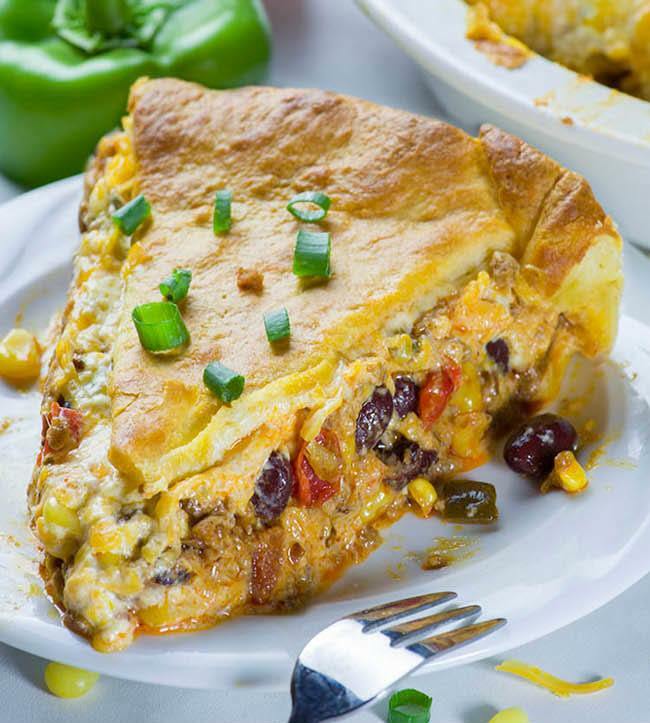 Your family will love to have for dinner this yummy cheesy beef casserole with bean, pepper, corn and salsa and you’ll love how easy it is to make. It’s great idea for weeknight dinner!!! Also, you can make ahead the filling and assemble it just before baking. Any way you can finish the complete meal for less than 1 hour of total time. Southwest Crescent Casserole is meal-in-one. It has meat and veggies, and that’s all packed in one delicious dish. On a busy day you just don’t have too much time for cooking, right?! Also I’m sure that you want to serve a real homemade food for family dinner. 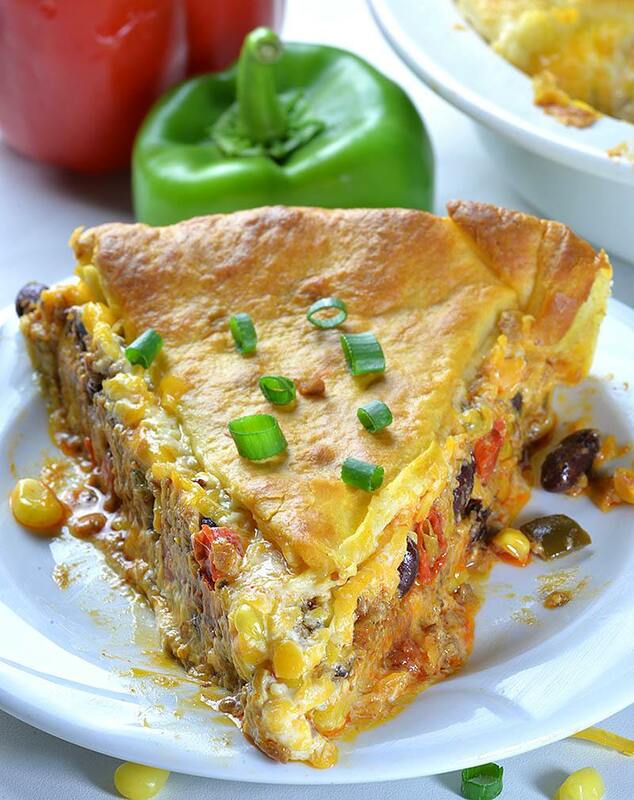 But this Southwest Crescent Casserole is quick and easy recipe for tasty and healthy meal. Therefore it would be perfect weeknight dinner. 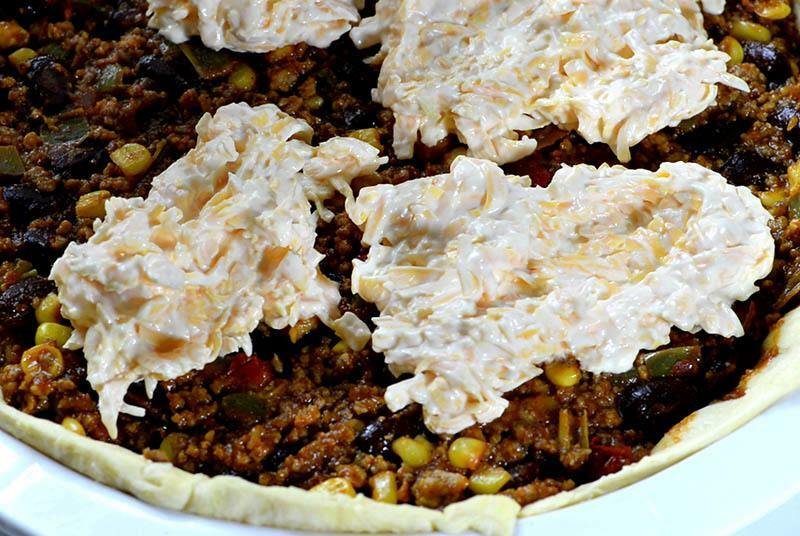 Making the filling for this casserole is simple and it’s adjustable to your own taste. Although I prefer chicken, I used ground beef this time. Beef casserole is great for dinner. It’s rich and generous meal. I added red and green bell pepper, corn and red bean. That goes so well with beef, at least to my taste. Then I spiced it all up with Taco seasoning mix and mixed with salsa. WOW, the filling tastes great on its own. You can wrap it in tortillas and make delicious tacos sometimes. But this time I wanted to make a casserole for dinner. So I take my favorite go-to ingredient-refrigerated dinner crescent rolls and made a crust for this Southwest Crescent Casserole. I arranged crescent rolls as for the bottom crust and spread the filling. Then I top it with a mixture of sour cream and shredded cheddar cheese jut to make everything very rich and creamy. Finally I arranged another layer of crescent rolls as a crust on top. Southwest Crescent Casserole turned out great, delicious and easy to make !It was a win-win situation! My family asked me to add this recipe to my regular weekly meal plan. Since it’s simple and easy recipe and they liked it so much I don’t see why not, so I totally agree with them. 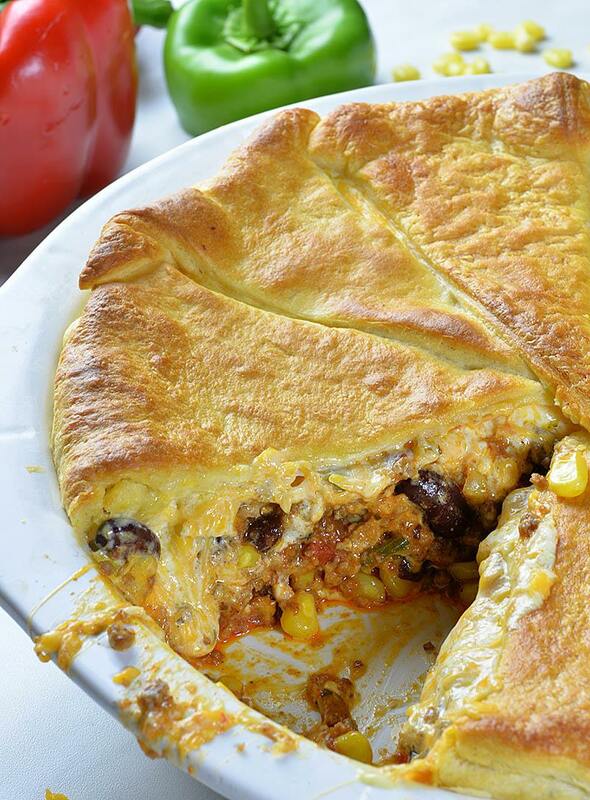 It’s great idea for weeknight dinner!!! Southwest Crescent Casserole is simple and easy meal for whole family. 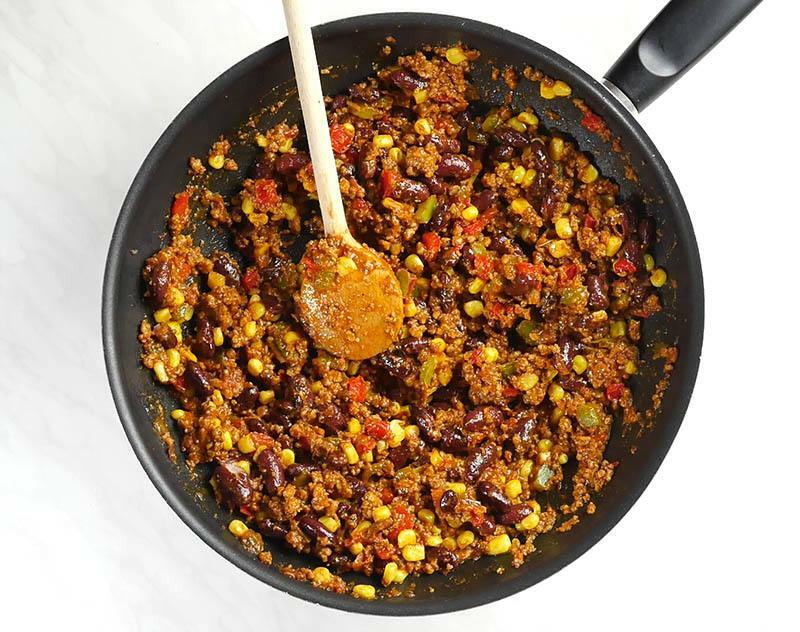 Place ground beef in a large skillet greased with 1 Tbsp. olive. Cook over medium heat for 8-10 minutes, stirring occasionally. Add diced peppers and cook for 2-3 minutes. Drain the mixture. Stir in salsa and taco seasoning. Cook for another 2-3 minutes. Stir in bean and corn, set aside. In a bowl stir together sour cream and shredded cheddar cheese, set aside. Preheat the oven to 375 F and lightly grease 10 inch round dish. Open one 1 tube of crescent dinner rolls, separate them and arrange 8 triangles at the bottom and sides of baking dish, press and seal well to create the crust. Spread beef mixture and smooth the top. Using a spoon drop cheese mixture over the filling and spread into an even layer. Open another can of crescent dinner rolls and arrange the triangles on top, leaving some space between them. Seal the edges and place in preheated oven. Bake 25-30 minutes until golden brown. Tent the top with aluminum foil if it starts to brown too quickly.